If you are on a Limited Data Plan, it is really important that you track the amount of data being used on your iPhone. 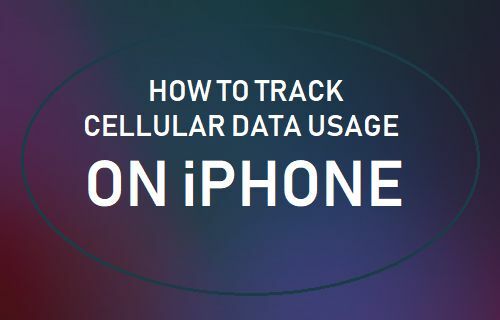 You will find below the steps to Monitor or Track Cellular Data Usage on iPhone. 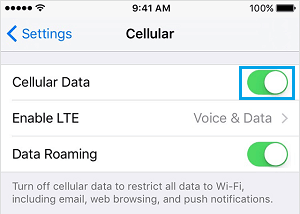 In order to effectively track the amount of Cellular Data being used on your iPhone, you first need to set up your device to monitor the amount of Cellular Data being used in a billing cycle. 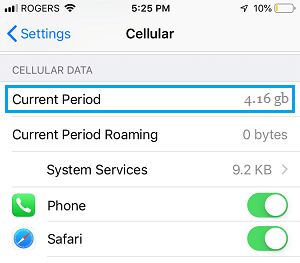 Ideally, at the beginning of billing cycle, you can follow the steps below to setup your iPhone to track the amount of Cellular Data being used in a billing cycle. 1. Open Settings > tap on Cellular. 2. On the next screen, scroll down to the very bottom of the screen and tap on Reset Statistics. 3. 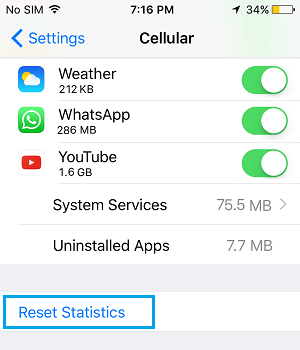 On the pop, tap on Reset Statistics to confirm that you really do want to Reset Data Statistics on your iPhone. Now, your iPhone is all setup to track Cellular Data Usage, right from the First Day to the Last Day of your billing cycle. On the last day of billing cycle you will get an exact reading for the amount of Cellular Data used by your iPhone. Note: At the end of Billing cycle, remember to tap on Reset Statistics, in order to clear the previous month’s data usage and start tracking Cellular Data Usage for the current month. Once your iPhone is setup to measure Cellular Data Usage in a billing cycle, it is really important that you get into the habit of regularly monitoring the amount of data being used on your iPhone. 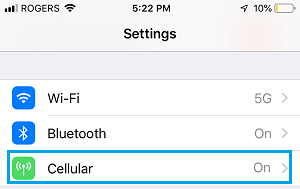 At any time you can check the amount of data used by your iPhone by going to Settings > Cellular and you will see the amount of Data Used under “Cellular Data” section. On the same screen, you will also be able to see all the Apps using Cellular Data on your iPhone. 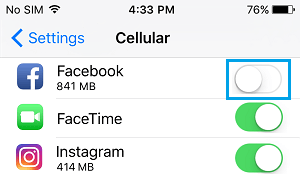 If any App is consuming excessive data, you can simply toggle OFF Cellular Data for that particular App and also switch OFF Cellular Data for other unimportant Apps. This a good measure in case you are looking at a high Data Usage and worried about the possibility exceeding your Data Cap in a particular billing cycle. In such a case, you can completely switch off Cellular Data Usage on your iPhone, in order to make sure that you are not paying more than your expected monthly bill. 2. On the next screen, completely switch OFF Cellular Data on your iPhone by moving the slider to OFF position. This will completely rule out the possibility of any App or service using Cellular Data on your iPhone. At the beginning of the next billing cycle, you can go back and Turn ON the Cellular option to start using your allowed monthly bandwidth. Remembering to manually Reset Data Usage Statistics at the end of billing cycle is not easy. Hence, you can set up a reminder on your iPhone to notify you, whenever it is time to Reset Statistics on iPhone. Setting up reminders on iPhone is easy, you can refer to our article: How to Set Up Reminders on iPhone, in case you need any help in this regard.